Key monsters and NPCs from the Rise of the Runelords Adventure Path come alive on your tabletop with the Pathfinder RPG Rise of the Runelords Pawn Collection, featuring more than 100 creature pawns for use with the Pathfinder Roleplaying Game or any tabletop fantasy RPG! Printed on sturdy cardstock, each pawn presents a beautiful full-color image of a monster or NPC from the Rise of the Runelords campaign, including goblins, dragons, giants, ogres, and dozens of unique NPCs also suitable for representing player characters. Designed for use with the Pathfinder RPG Bestiary Box, each cardstock pawn slots into a size-appropriate plastic base from that collection—making them easy to mix with traditional metal or plastic miniatures—and supplements that set’s creatures, together providing pawns for nearly every Rise of the Runelords encounter. 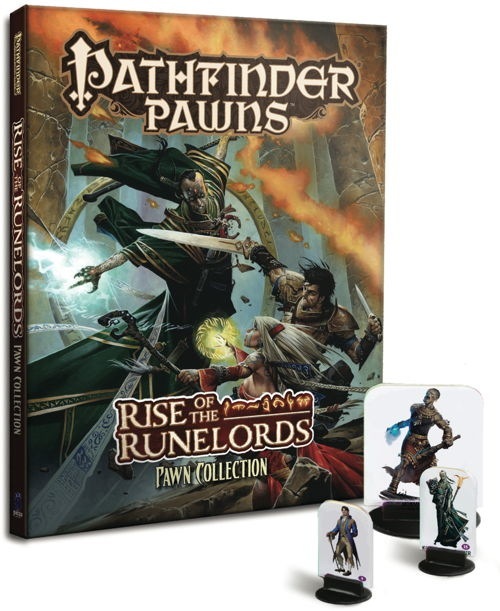 With multiple pawns for commonly encountered foes and tons of distinct creature images, the Pathfinder RPG Rise of the Runelords Pawn Collection brings the enemies and allies of Pathfinder’s original campaign alive like never before! Note: This product does not include bases. It is intended for use with the bases found in the Pathfinder RPG Bestiary Box. If you don't know, "pawns" are double-sided images of monsters or NPCs printed on cardstock, designed to stand vertically with a plastic base that's the same size as the creature (so a Large-size monster with sit on a 2x2 base and its pawn will be bigger than a Small-size creature, for example). Pawns aren't as good as true three-dimensional miniatures, but they're a lot cheaper and are still better than simple flat tokens. The Rise of the Runelords Pawn Collection contains around a hundred and fifty pawns with sizes ranging from Small all the way up to the Huge. The artwork for creatures and NPCs unique to the adventure path comes from the Anniversary Edition hardcover collection, and it's fantastic. The set also includes several pawns for creatures that appear in the AP but aren't unique to it, and the artwork for these pawns comes from the creature's Bestiary entry. Each pawn is numbered and labeled, and there's a list on the back, which makes sorting pretty easy (I use ziplock bags). The set *doesn't* come with bases, which is an important point for someone who doesn't have any other Paizo pawn sets. The physical quality of the pawns is high. I'm writing this review at the halfway point of the AP, so I've used the set in about 50 sessions so far--all of the pawns are still in good shape, with no tears, bent corners, etc. They fit well with standard Paizo bases and are quite colorful. Perhaps the most important thing to ask is how well simplify GM prep: in other words, are the pawns that are included of the right type and number to handle encounters in the AP? I'm at exactly the halfway point of the AP, so I think I have a pretty good sense of how much coverage there is, and my verdict would be: it's very hit or miss. The set is great on including pawns for "bosses" unique to the AP and some NPCs--as a rough guide, if there's a full colour illustration of the monster/NPC in the book, there's probably a pawn included in the set. For more normal encounters, however, the set is unpredictable and the choices made of what (and how many) to include of different creatures doesn't follow a consistent pattern. For example, the set comes with 8 rat swarms which is plenty for any encounter listed in the book, but doesn't come with any shadows and only 1 yeth hound which complicates planning for those encounters in Thistletop; it includes 4 ogre pawns, which sounds great, but there's an encounter in the Kreeg Clanhold with ten ogres simultaneously. Etc. I'm not complaining so much as trying to make it clear that owning this collection (even along with the Bestiary pawn box) doesn't mean that every pawn needed for the game will be at your fingertips: you're still going to have to make homemade tokens or cobble together substitutes for many encounters. In addition, the collection doesn't include any creatures that appear on the AP's random encounter tables (unless those creatures also appear in planned encounters). In the end, I can give a partial endorsement to the collection. It contains enough to make it worthwhile, but not so much to make it a must-have. For a players who are just starting out, and may have the Beginner Box, this is a really great incremental augmentation to a growing pawn set, and is a very affordable, and exciting addition. This Pawn set has the benefit of a good ratio: a handful of NPCs, Some good monsters, and cultists, a clutch of named characters including Karzoug. The medium monsters are mostly giants due to the ROTRL story path, and the huge monsters are giants and spiders. But, what this set has is Goblins Galore! C'mon! You need Goblins! IN CASE ANYONE READING THIS DOESN'T KNOW: The ROTRL pawn set does not contain the core iconics! Valeros and the gang are in the "Pathfinder Pawns NPC Codex Box" (The Beginner Box includes Merisiel, Ezren, Valeros, and Kyra), and the Skulls and Shackles Iconics are in - wait for it - "The Pathfinder Pawns Inner Sea Pawn Box". Also, like the other reviews said, there are no bases. I like the set a lot, even though i comes without bases. I have some bases from a completely different (board) game that I use until I get my hands on one of the Bestiary boxes. The missing 5th star is because many of the drawings extends to much outside the actual figure IMHO. These are essentially useless unless you already own a Bestiary set, or feel like shelling out another 20-odd dollars for bases. Very sweet, so happy to see that the pawns are going to be expanded upon. Am noticing this product will be sans bases. Am wondering if this is going to become a theme for future adventure path pawn releases, and if so, would it be a possibility to order a bag or two of the bases, as sometimes, you just need to field a lot of stuff, and with just the set I have now I find myself running short on bases constantly. Where do I sign up?! Oh and WANT! A very cheap alternative. IMO options are a good thing, I don't think the pawns will cannibalize the miniature sales. I'm not sure I like the product coming out sans bases, I hope bases will be an option for those interested. Keep the pawns coming! Especially huge and larger creatures, the ones that would make unfeasibly big miniatures. So happy about this, preordered!!! Are these going to be double sided? This bases costs only cents in production, so please be serious and put a bag of bases inside too. The Bases may cost cents to produce, but including them in the box means that the size of the box has to double in height. This will add quite a bit to the cost of the product, since boxes are a costly way of packaging. They are trying to keep the cost of the product down for the consumer. Now that you have both this and the Bestiary Box (and hopefully more Bestiary Boxes to come), what are the chances of having a Pawns Subscription? Or is this just going to be a one off to coincide with the RotRL Anniversary Hardcover? The Bases may cost cents to produce, but including them in the box means that the size of the box has to double in height. It probably much more viable to offer a bag of bases as a separate product. errr... Why? Did you get a Beginner Box? The bag that the Bases came in was just as thick as all of the unpressed Pawns put together. This would be what I would expect. I think that it will have an impact on the mini sales, although whether that is a problem depends on the net profit that Paizo make on a set of pawns wrt a set of minis. I almost canceled my pre-order for minis when the Bestiary Box was announced. I want to get that one first crate in to see the quality of the plastic minis and then I'll decide about future mini purchases. I'll be getting the pawns as they are released with no extra thought required. Edit: Oh, on the topic of bases, I'm glad this doesn't have any. As an international customer, anything that decreases bulk and weight is appreciated. I am hoping they sell the bases, however. The more times you insert and remove something like this from the base, the looser it gets, until eventually it doesn't stay in the base. I really want to insert the cardboard once and leave it, rather than continually swap out bases because I've got more pawns than bases. Well, I wouldn't have the space to keep about 350 pawns all standing up somewhere all the time. I will store them in the boxes and add the bases as they are used. Note that adding more bases to the box will also increase the weight, which increases shipping costs (something that we've very much got in mind for our international customers). Yea more pawns. While I don't want/need them, I'd glad their available for the people who do. This is super-cool, very happy to see Paizo exploring this product space. You really want to tell that some bases will double the height of the box? don´t fool yourself! in this case the volume weight is more important. and this wont rise too much with some bases inside. real weight is only considered when it higher than volume weight. But this happens only when have something like bigger metalparts (brake discs) in your box and not with some paperprints and plastic bases. If the next available size box is double the current box, then yes, it will. Putting in another sheet of cardboard can double the box size if the current box is packed solid and you try to add anything more. I have the Beginner Box and it is easy to see how adding bases might double the size of the box. I think this is a good move by Paizo since they will undoubtedly eventually offer bases as a standalone item and anyone that starts to collect a number of these is going to go nuts with the number of bases they will eventually accumulate. A lot of people here (including Liz) are operating on partial information. There is no "box" to this product at all. It's five sheets of pawns with a cover "wrap" similar to the GM Screen. Adding bases would force us to put it into a box, and would probably raise the price by at least a couple of dollars. We plan to sell bases separately. We haven't announced that yet because we haven't figured out the pricing, but yeah, there will be more bases available for those who want them. Different sizes and colors of bases would be awesome. Completely agree. We are looking into it! Personally, I'd love to see you guys work on both ends at the same time. So a Jade Regent or Skulls and Shackles set. That would also cut down the redundancy with the paper mini line. But in the end, I'll support it regardless. Oh and for the people concerned about bases, I hope you are aware that a number of companies have already created the exact product you're looking for. Unless Paizo is planning on putting some Pathfinder spin on it, I'd think the bases that come with the Beginner Box or Bestiary Box should cover people's needs. Great idea at a perfect price. I am also sold! COOL! Even more pawns that gonna obay my power and rule! Will this product include some of the much larger than normal critters like the Gargantuan rune giants? They are kind of a big deal in chapter six (pun intended). I spoilered my post about what was in chapter six regarding critters and it might be a good idea for others not to do these kind of reveals also. Just saying. Currently no (because Gargantuan creatures nearly demand their own sheet, skyrocketing prices), but we may revisit that as we assemble the set's contents. Oh, and there are no Gargantuan bases in the Beginner Box, so that's another problem with really big dudes. Check out the part six paper minis, there are some very large minis that look great. damn it. june? stop teasing. this is something i want to own tomorrow.